Yolanda Young also saw the ring of smoke. She heard a crack of thunder, and saw the smoke from her office on the northeast side. “I looked out and saw a black trail of smoke and above it was this complete black smoke ring,” [...] “It was rising higher and getting stretched out.” [...] the National Weather Service says it is rare to capture this on camera. “I just saw this huge bright, white lightning bolt strike down,” recalled Kelly. What it hit was a transformer. Most folks saw the aftermath. “The cloud just started to mushroom - probably 50 to 60 feet off the ground,” explained Rod Snowden. And it turned into a ring, ominously floating across the sky. “I guess at that point it started to break loose on the other side of the airport, probably around about [Highway] 281,” Rod said. The mysterious ring dissipated, leaving no proof of its existence except these photos. There are no reports of injuries from the blast. 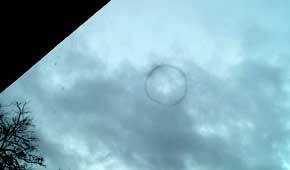 We notice that the "explanation" offered is that this strange "smoke ring" in the sky must have been a consequence of an unusual "lightning strike. Of course that inspired me to try and remember if the previous event that I had recently read about involved lightning or something similar that could be "blamed" for the phenomenon. 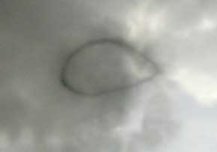 It is curiously similar to the recent "smoke ring" object in several respects. "On many occasions, UFOs are reported to become gradually engulfed in a vapor cloud. The fully developed cloud then looks like any other cloud in the sky and affords the UFO a very convenient "hiding place." 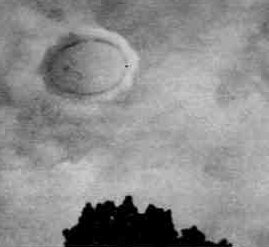 "The series of photos made by the army private shows not only the rare ring object, but also shows it gradually becoming engulfed in a vapor cloud." The photos were taken in September of 1957. It was around 9 in the morning and an army private was working inside a large building on a military base when several other men started yelling for him to come outside and see the strange thing that was coming overhead. 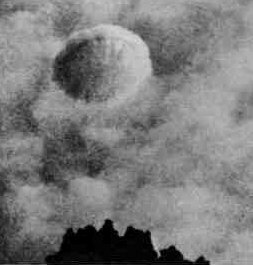 He rushed outside and, seeing the estimated 60 ft diameter object, went to his car to get his camera to take the photos. The entire sequence was taken within about a minute which means that this was all it took for the vapor cloud to become fully developed: an estimated 60 seconds. Later, after discussing the object with his fellow soldiers, the private thought that it might have been some sort of secret army experiment and he ought not to have photographed it, so he determined to say nothing to keep from getting in any kind of trouble. He kept silent for over ten years, at which point he showed the photos to a friend who suggested he show them to NICAP. "I refer to an old expression: there is more to it than meets the eye." The Charles Early sighting is really quite bizarre in and of itself. But, taken with the ring photographed by the army private, we notice that in neither case was there rain or any idea that lightning could be implicated in producing the phenomenon. Early was raking leaves at his home in Greenfield Massachusetts, under a clear sky, when he heard a "swishing noise" as if a wind storm was coming. He looked up and saw two rings parallel to each other, one on top of the other separated by a distance of about 4 feet. He estimated the diameter to be about 30 feet and described them as "bright, like polished chrome" and tubular. The pair of rings were whirling through the air maintaining the same relative position to each other, and at one point they zoomed toward Mr. Early on the ground at such speed he was certain they would crash into the ground. But just before reaching the ground, they rose up again, spinning in a clockwise direction. At first the double rings were horizontal, but then they flipped vertical, hovering over Mr. Early for about a minute before moving away about 50 feet, at which point they resumed the horizontal position. The double ring began to move away in the direction of a factory, then accelerated toward a mountain at the speed of a jet. It then banked, returned to Mr. Early, and then shot straight up into the sky so fast it was gone in a few seconds. Mr. Early said that when the double ring was directly over him it made a "humming" sound similar to the hum heard when standing under electrical wires. 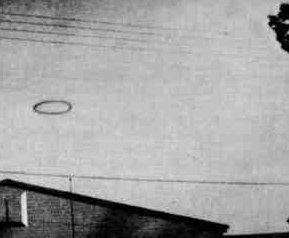 A couple of other "ring UFOs" have been reported, generally with metallic features and even with a "spindle" in the middle in one case. 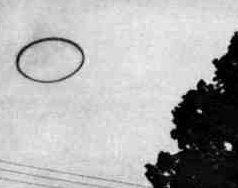 Jacques Vallee published a report of a ring type UFO that occurred just 13 days before the famous Socorro sighting of Officer Zamora in New Mexico. Vallee's report was of a sighting witnessed by four people, lasting around 45 minutes. One of the witnesses looked at it through binoculars and said that it was oblong and vertical and that it was "boiling out" wisps of smoke. At one point, the object emitted a blast of light and shot forward at high velocity, and the "retracted its path" in the same manner. It finally divided into several smaller objects. We note that in the Early case, the UFO emitted an electrical sort of "hum," and in this latter case, there WAS a "blast of light" as was reported in the recent case in San Antonio. We cannot, therefore, exclude an electrical component to the phenomenon. However, it doesn't seem that electricity causes it, but is caused BY the ring "object." 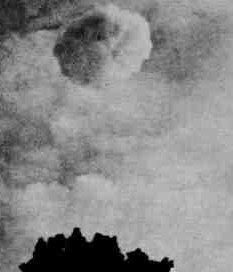 French UFO investigator, Aime Michel - in his 1954 survey of French UFO cases - called these types of UFOs "cloud-cigars." They have been observed in Great Britain, South America, Poland, the US, and the former Soviet Union. "I believe that the human eye and the camera saw only a part of the aerial object." In the above photo, the strange ring object is approaching slowly over the roof of the army barracks. Ring continues moving along over the power lines. The cloud begins to form rapidly but the ring can still be seen. Here, note the "ribbing" effect as if there is some "vortex" shaping the cloud. Completed cloud, no sign of ring visible. Now, let's just have a look at a few other strange clouds photographed in Florida, I believe, over the East Coast about a year or two ago. Any readers with details, send them in. Pretty interesting, eh? Particularly when you note the "ribbing" effect that was also present in the 1957 "smoke ring UFO" photos. Notice also the "vortex" that is clearly evident as a sort of "tornado" extending down out of the "hole in the sky," not to mention the very specific "shape" of the thing - a giant "mothership" that is partly hyperdimensional? Well, we just wonder how much stuff is going on right over our heads that we - as Professor Maney suggested - simply cannot see either with our eyes or our technology. It's interesting how the Cassiopaea staff regularly discounts rational explanations for phenomena. For instance, the smoke ring was caused by lightning hitting a transformer , producing a mushroom cloud which, as it dissipated, produced the smoke ring. Now, what's so hard to believe about all that? Dave probably did not read Laura's article carefully, or he missed the point, or, most probably, both.Which is in no way his fault. While it is true that finding "rational explanational" of phenomena is always useful, it is not always the case that a "rational explanation" explains everything away. There are no rational explanation of quantum phenomena, as anybody can find from my homepage and my papers. And yet many non-scientists will think that there is one. While physicists discuss alternative explanation, and there is no one theory that has no counter-theory, laymen think that physicists KNOW how and why things happen. With smoke rings, weather and other non-linear and dissipative phenomena the situation is similar. While "standard and rational" interpretation is always there, ready for laymen, experts go deeper. They would discuss "synchronicity", they would duscuss "multi-dimensional time". they would discuss faster-than-light propagation, acausal links, Kozyrev's ideas, Lawrentev's and Eganova theories and experiments etc. etc. 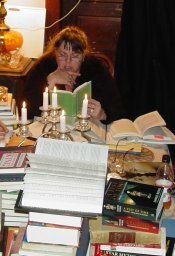 The above article just draws attention to some things that are similar and speculates how easy it is to state that the cause was a lightning strike of a transformer, rather than being open to the possibility that such lightning - as well as other phenomena - could have a different cause than what is offered as "rational explanations."